Business intelligence, data mining and real-time big data analytics are not the exclusive domain of bigger enterprise class companies. Take a look at the business ‘dashboard’ that is displayed above and you will see that we are driving real time business information in the form of metrics and key performance indicators (KPIs) to a specific role in the organisation. In this example we are showing the Sharp-aX Directors Dashboard and we are sampling real-time data that shows, at the top left of the screen, sales (revenue & GP) for the current month and year to date. Below this we are showing product sales by product for the current month and year to date. At the top right, we are showing our profit & loss position for sales & discounts, purchases & discounts and also overheads, again in real-time. Finally at the lower right hand side of our dashboard we are showing a rolling 12 month cost graph. This is beyond business intelligence; it represents the beating heart of your organisation’s business health and with this information you can start to make informed operational decisions that align with your business strategy. Because this is live data, you can also drill down into the detail in order to understand the root cause of any anomaly and you can do this at anytime, anywhere. Imagine managing your business by exception whilst relaxing by the pool. Completely in control! This sets a precedent whereby we can create a KPI based dashboard for any formal role in your organisation, from the Chairman to the trade counter, with relevant business information being mined, extracted and presented to the user in real time to enable them to make timely decisions and enable you to monitor, measure and control their activities. This may seem like a dream to many small wholsalers and business owners who have traditionally supported their fledgling business with manual, paper based spreadsheet systems then migrated to a series of stand-alone ‘point functionality’ systems to support their growing needs – by this we mean a standalone system for accounts, another for quotes, another for web, ‘ad infinitum’. The upside to this approach is that it appears that costs are kept down but in our experience this is a fallacy where in real terms what is being introduced to the new business are a series of standalone application silo’s resulting in a marked lack of efficiency with errors introduced due to manual re-keying of data, a large amount of time wasted and huge amounts of paper being generated and stored (which again introduces inefficiencies to the process as it then takes an inordinate amount of time to find and recover paper based information). Plus this approach introduces cost of support/maintenance multiplied by the number of applications supported. Control purchasing and ensure that your best-selling products are available. Receive a warning when best-selling products are running low – monitor On Time and In Full. This is just a small element of the Sharp-aX system which is written specifically for the small to medium wholesaler and incorporates our unique and fully integrated customer/web shop/stock and accounts management suite of software. Sharp-aX has developed this solution specifically for the modern wholesaler. It has been created by our own in house team, out of 30+ years’ experience with the wholesaler marketplace. The Sharp-aX solution allows you to create the ideal back-office system to support your business growth, modelled around your specific business and workflow processes and flexible enough to adapt as your organisational needs develop. Your Sharp-aX implementation will also bring together the entire workforce as one collaborative team, introducing efficiencies (reducing cost/overhead) and empowering decision making – increasing your revenue and most importantly your gross profit opportunity. Your solution also introduces the combined benefits of ownership, control, role based access, user defined on-demand reporting and real-time business intelligence plus 24×7 availability. 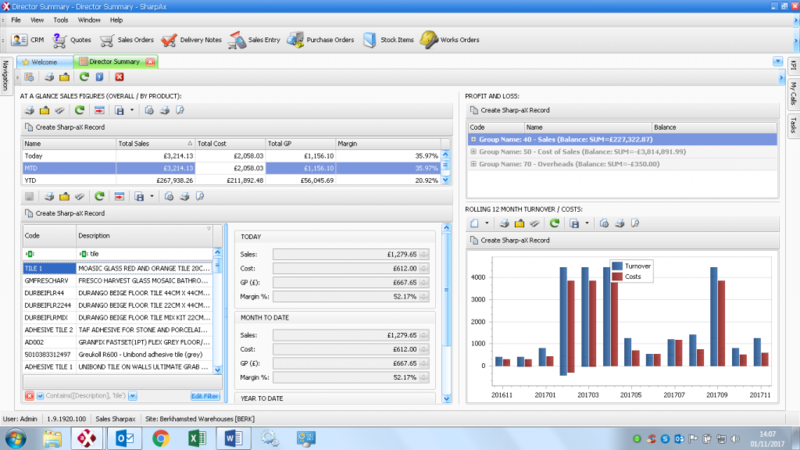 Please contact Sharp-aX to discuss how we can deliver enterprise class functionality to your wholesale business today. This is a free of charge consultancy exercise to understand your specific wholesale business pains and address them using our flexible Sharp-aX solution plus 30 years of experience serving the small to medium wholesale business market. Once we understand your requirement in more detail, this exercise will lead to a 30 minute focussed demonstration where we will present your solution overview. You have no obligation and everything to gain.